This post is in remembrance of former Assistant Attorney General John Doar, who passed away in New York City this past week. He was 92 years old. Many will be familiar with him from the Civil Rights demonstrations of the 1960’s, where he was on the front lines facing the violence of segregation on its deathbed. He was dispatched to Montgomery, Alabama in 1961 along with John Seigenthaler, to protect the Freedom Riders. The Freedom Riders were a group of young, idealistic students who wanted to dramatically demonstrate to the world that it was not possible to travel from one state to another without the risk of violence if you were African-American. This demonstration came at the same time as the Lunch Counter sit-ins which took place in many of the segregated cities were occurring. John Doar’s role in the movement came about in a kind of left handed way. The Kennedy Administration was about to have its first summit with the Soviets and the specter of violent protests calling attention to the lack of freedom for African-Americans was the last thing they needed to be packing along with their bags when they went abroad. He prosecuted Collie Leroy Wilkins for federal civil rights violations in the murder of Viola Liuzzo. This was extraordinary as the jury was all white and the trial took place in 1963 in the segregated state of Alabama. Later that same year he confronted and calmed an angry mob after the assassination of civil rights leader Medgar Evers, murdered outside his home. The following account of the rioting which took place in the wake of that murder demonstrated Mr. Doar's faith in non-violence as a weapon. 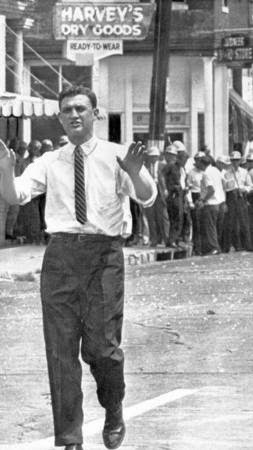 "Into the no-man’s land between the police and the rioters walked John Doar. The crowd stopped for a moment, stunned as though they were watching a ghost. Then bottles, bricks, and other missiles began crashing around him. Doar called to the crowd. “You’re not going to win anything with bottles and bricks,” he said. He could hardly be heard above the roar of the crowd, which began to encircle him. A man with a tire iron lifted it and took aim at Doar’s head. An angry black woman yelled in his face, “We get our rumps shot up!” She asked with sarcastic disgust, “Are we gonna wait for the Justice Department?” Doar pleaded, “Aw, give us a break.” Then he shouted again, “Hold it! Is there someone here who can speak for you people?” One black youth emerged from the demonstrators and joined Doar in the street. “This man is right,” the youth said, pointing at Doar. “My name is John Doar—D-O-A-R,” the official called again and again. “I’m from the Justice Department, and anybody around here knows I stand for what is right.” He walked toward the mob, shouting—begging—for the crowd to disperse. “Medgar Evers wouldn’t want it this way,” he called. In an alley, a CORE worker grabbed a teenager with a rifle who was taking aim at Doar. “Hold hands with me and help us move these people along,” Doar said to some nearby protesters. A few people linked hands and they slowly began to push the mob back from the police line. A massacre was averted. Barricades were removed and a motorized streetsweeper began whisking up the broken glass and other hurled debris." During the March on Montgomery in early 1965 he was in the front of the 3rd; and successful; attempt to reach the state capitol, walking “point” one block ahead of the marchers. He was Assistant Attorney General to Robert Kennedy at the time. 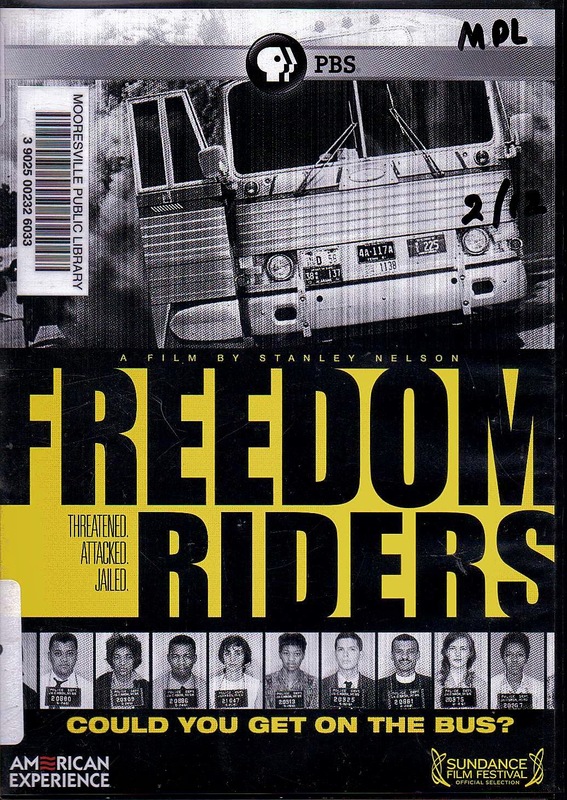 This film captures all of the drama and fear that were part of the Freedom Riders campaign. Utilizing one Greyhound Bus and one from Trailways, these brave activists; recruited by the Congress for Racial Equality, or CORE; set out to highlight the segregation that was commonplace in the cities throughout the Southern states. On May 4, 1961, the first group; consisting of 13 African-American and white civil rights activists left Washington, D.C., in an attempt to integrate the rest rooms and waiting rooms at bus stations along the way on the journey South. African-American Freedom Riders tried to use “whites-only” restrooms and lunch counters, and white participants attempted to use the “Colored Only” facilities. What many people do not realize is that the Freedom Rides were meant as a replication of the 1947 Journey of Reconciliation, designed to test the 1946 U.S. Supreme Court decision in Morgan v. Virginia. That decision held that segregated bus seating in Interstate Commerce was unconstitutional. This did not apply to the individual states and it would be another 9 years until Rosa Parks refused to give up her seat on a local bus in Alabama. The violence began as soon as the first bus hit Rock Hill, S.C. on May 12. The next day they were again attacked in Atlanta, Georgia where some of the riders boarded a Trailways Bus. By the time the Freedom Riders hit the state of Alabama the violence was so out of control that the bus could not even stop at the terminal. With an angry mob slashing tires and breaking windows the bus left with a contingent of angry whites chasing it. When the tires finally gave out the bus pulled over and the white driver fled. The mob then threw in gasoline bombs in an attempt to smoke the passengers out. When they emerged they were beaten under the watchful eyes of the Alabama State Police. The images of the burnt bus made the front page of newspapers worldwide. Throughout the summer the Freedom Rides continued until the Interstate Commerce Commission issued new regulations barring discrimination in accommodations at bus stops acroos the country. Thjis had the same effect as the 1946 Supreme Court Ruling, and it would be another 4 years before the Civil Rights Act would be finally passed and enshrined as law. This film captures all of the drama and violence which invaded our living rooms via the nightly news, and eventually changed the way we looked at ourselves in terms of being a truly free country. And while all of this was happening here, the struggle in South Africa was portrayed as something different and more evil, while in reality there was no real difference at all. This is an important film for these times, when some people are calling for a repeal of the Voting Rights Act of 1965 and other legal protections which were won by the hard work of many people at grave risk to themselves. The fact that there are people trying to roll back those protections is ample proof in itself that these laws are still very necessary. Watching this film is one of the things you can do to honor the memory of the late John Doar.